13 Aug, 2018 in big why / goals / leadership / monday-motivations by Minette Riordan, Ph.D.
Or more like the girls in Annie singing “It’s a Hardknock Life”? Yes, we can get knocked down, overwhelmed, and frustrated by the process of growing a business. Yes, can mess up, make mistakes and launch to the sound of crickets rather than crowds. When we approach life from joy, when we allow our deepest wishes to fly out into the world, we soar through the challenging moments. This is the reason why having a clear vision and knowing your deepest WHY behind your business is so important. The WHY is the part that makes your heart sing. That allows you to choose joy over fear. If you don’t know what your WHY is, check out this awesome Ted Talk from Simon Sinek. Inspire yourself today and everything else will feel easier. Here’s Brad and I’s big WHY: To empower others to share their unique brilliance with the world so that together we can solve the world’s biggest problems. We want to eradicate illiteracy in the world. When people know how to read and write, they have choices and they have more control over their destiny. Saying this out loud is BIG. Scary. I don’t know how I will make this happen, but I know if I can help just one person then I am on my way! 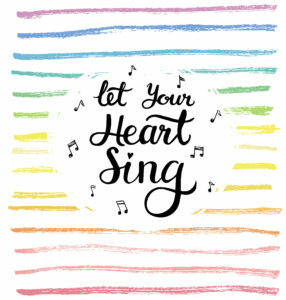 Let your heart sing today as you begin the week. Listen to what it has to say to you. P.S. I’d love to hear what your big WHY is, come on over and share in the Productivity for Creative Business Owners FB group. Everyone needs the inspiration and the more you share your why, the more others that need you can find you. See you there!